What to wear for Gatlinburg family pictures? Such a simple question right? Yeah, it's not for me either. This is a HUGE stress on so many of my clients, and even myself when I get ready for family pictures. I don't know about you, but I really don't welcome additional stress in my life. A big hurdle is color scheme; it can be tough! Pulling everyone together while being worried about looking like a box of the reject crayon colors. I personally love really classic, timeless looks and adore neutrals like cream or grey being the main focus, or heavily incorporated. Chambray and denim are also great for casual looks. Don't be scared of a bit of pattern, but keep it fairly subtle. Not everyone has to exactly match, mixing in colors, layers, and those simple patterns create a beautiful texture and look for your Gatlinburg family pictures. I've made some swatches with some of my favorite color combos that photograph beautifully. These are a few of my favorite schemes, especially for big groups. There are hundreds of beautiful combinations though, and so much more I would include if I had space. When you start planning, I suggest starting with Mama ( or the women in the case of extended families with several Mamas to please). The old saying, " If Mama ain't happy, nobody is happy" does have some truth to it. Mom, you're most likely in charge of planning your family pictures in Gatlinburg, and the wardrobe is totally up to you. Once you've picked your color scheme, focus on finding flattering pieces for yourself. If you have any areas that aren't your favorites, really work to camouflage those. It can be as simple as wearing a light jacket, or lacy cardigan to cover your arms, or a flowy top, layered with light jacket, or high waisted flowy skirt to hide a tummy. These little tricks will make you feel SO much better about how you look. Now that you've found an outfit you adore, fit everyone else's in. Layers are GREAT, jackets, kimonos, cardigans, half-zips for the guys: all of these create really great texture and interest to add to your photos. Notice in the net picture, the slight texture the Dad's shirt, the embroidery detail on the sweet girl's tops, and how the denim jacket really pulls this beautiful Mama together. This fabulous family looks amazing! The Mom chose a beautiful figure-flattering dress, and used light patterns and different maternials to create texture and interest in theor outfits. A fabulous example of neutrals with a tiny pop of color! So classic and timeless for your walls. This dark khaki, taupe, and grey combo is one of my favorites for Gatlinburg Photographer sessions! Here's how to do bright colors! Throw in a few neutrals, and make sure everyone ties together, for a great look for your family. If you follow these few simple tips, I promise you all will look magazine worthy and feel great! This beautiful family of three booked their family photos with me during their Gatlinburg vacation. The Smoky Mountains are such a beautiful place, it always makes my heart happy when I get to photograph families in our beautiful scenery, with mountains and woods all around. Photographers in Gatlinburg are just so lucky to live in this beautiful area and capture memories for families enjoying a fun time together. The Dahman's sweet daughter is just three and she ROCKED! 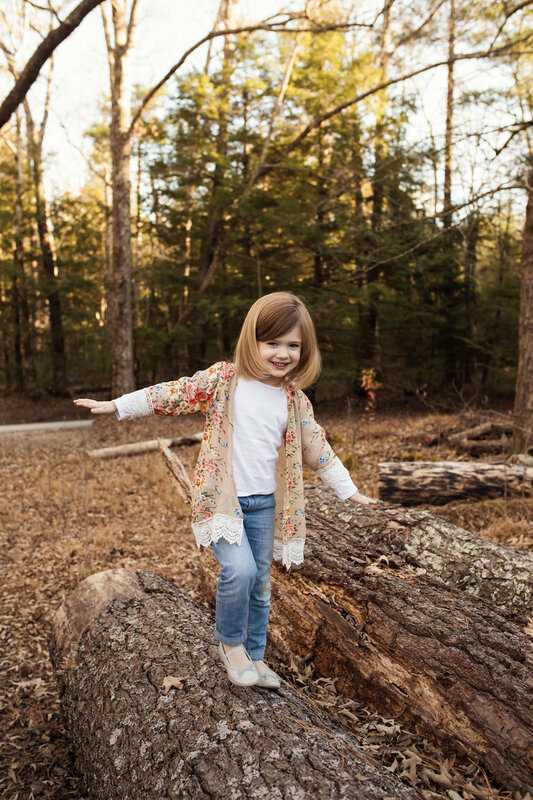 She was up for every challenge, from balancing on logs, to twirling her skirt, to loving on Mom and Dad. Sometimes little ones aren't quite so eager, but getting to play a little bit really brings them out of their shells. Showing off the best parts of a family is such a wonderful part of my job as a photographer. The Dahmans are a perfect example. There's so much love and energy in their pictures; just beautiful. Jamie's little family was so sweet! They were visiting Gatlinburg all the way from Michigan. We spent the afternoon exploring and playing in one of my very favorite spots on earth, Cades Cove. The littlest member started off a bit grumpy, having fallen asleep on the trip over from Gatlinburg, but after a few minutes to warm up, he was laughing, and playing, and showing his truly joyful little personality just like his sweet brother. Those two sweet boys seriously cracked me up! Family photos while you're vacationing in Gatlinburg are so fun! You get these beautiful mountain views, and to enjoy the serenity around you. It's so peaceful and beautiful there, I sometimes just stop and enjoy the views for a few minutes after my sessions, and watch the sun completely set. Sometimes little ones ( haha, okay, most of the time) don't enjoy standing still and looking at the camera for those above the fireplace shots, so I love to mix in some tickling and playing fun for them. This next one was a mixture of tickling, and playing who can not smile the longest! 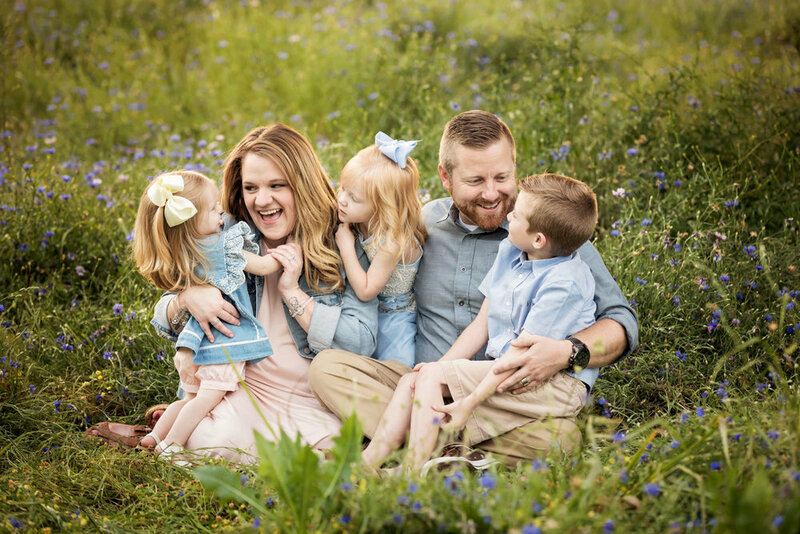 Fun is KEY to a great family session. These two boys were amazing little characters! Seriously, we laughed and played through our poses (and silly faces). I adore their portraits; so cute! Their Mama picked out outfits that complimented their Smoky Mountain location beautifully. Meet the Hull Five! This beautiful couple and their three stunning and beautifully behaved, children bravely handed over full creative control of their family picture session to me. I can't even begin to tell you how much fun we had. We played, romped through the tall Knoxville grass and laughed, and did just a wee bit of posing. Having fun during your session is a MUST. When everyone is more relaxed, it shines through your pictures. These guys had so many amazing ones, that I could hardly pick out just a few images for the blog. Fun family poses during your Knoxville photography session are just as important as those beautifully posed shots above your fireplace. They keep kids spirits up, and everyone interested and looking happy. I adore both types of pictures and tried to include both in the Hull's family session. 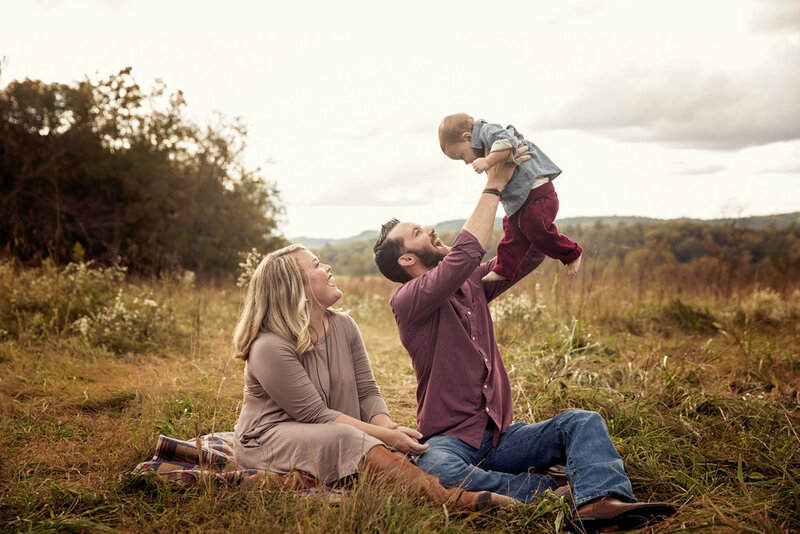 Knoxville family walks through grassy field towards photographer. Mom laughs in family picture at secret from little girl. Whimsical family portrait laying in field of flowers. Parents swinging little girls during family pictures. Little boy give Mom wildflower bouquet during Knoxville family photogtaphy session. Dad poses with his three kiddos in Maryville field of flowers. I've never seen siblings love each other as much as these three! While I'm sure they have their moments at home, they did great in front of the camera, posing and playing together beautifully ( I'm not above a bit of bribery to ensure beautiful pictures *wink wink* and being able to hold my squeaky pig may have been promised). Three siblings posing in grassy field. The Napier's sessions was such a fun one! 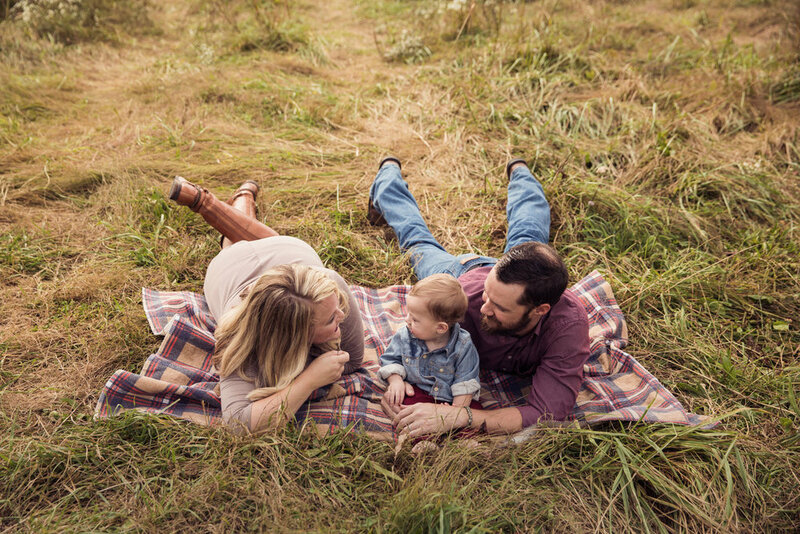 This lovely family invited me to come photograph their family session on their Maryville farm. If you know me, you know I am farm ( and farmhouse) obsessed, so this was right up my alley! Exploring their beautiful property made for a wonderful afternoon. Part of the farm had the perfect mountain view for Smoky Mountain family pictures! I could look at that view all day long! What an amazing spot for pictures. Their three beautiful children were absolutely lovely to work with ( as well as the fur baby!). We had quite a few laughs while they worked so hard to wrangle the pup into their sibling picture. Poor pup just wanted to run while we insisted he sit for still. What you don't get to see, is that literally 3 seconds after this shot was taken, pup bucked all three of them off of him and made a run for it! The property was so perfect! It even had all kinds of darling, rustic buildings for us to use as backdrops. It really injected a ton of personality into the Napier's pictures. The beautiful Bennett family invited me out to their lovely property for their Knoxville photography session. 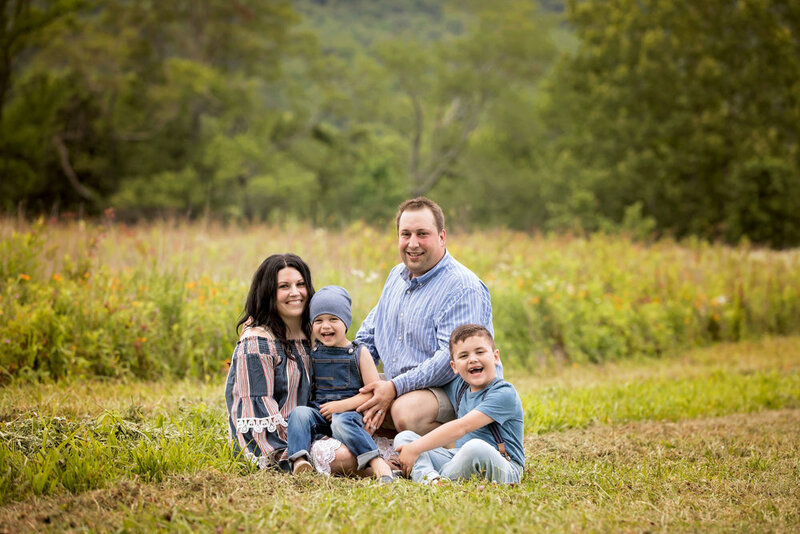 It was the perfect setting for their family, and they were so gracious to allow me to explore and ask questions about their land ( we hope to build a small farm in a few years, so I love to soak in everything I can on the subject). It was a great session, full of laughter and smiles; even the littlest one did beautifully. we played in a field of flowers, and walked through the woods. I can't imagine a better afternoon! The Bennetts home had so many beautiful spots for portraits! My favorites came from their field in the back with pretty, rustic fence posts and flowers galore. While posed pictures are beautiful, and usually end up as stunning wall art, I myself love a good candid! Catching real moments of love between a family makes my job all the better. A grouping that gets overlooked the most, is pictures of just Mom and Dad! I really love sneaking a few in to family sessions. Family portraits are super important, but sometimes it nice to have one of just you and spouse at that stage of your life. Plus, they're so adorable! One day their little ones will look back on their love story as something to aspire to. These two sibling were AMAZING together! Little miss was the best big sister and did a great job helping with these poses. 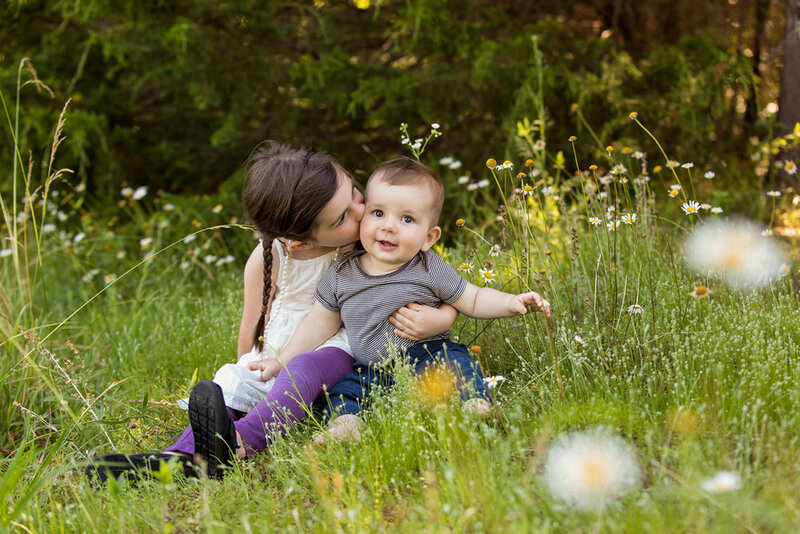 She was very loving and patient and with her baby brother, which allowed me to take some beautiful pictures of the two of them <3. The flowers were the perfect setting, plus the beautiful kids; perfection! A few weeks ago, I had the pleasure of meeting the wonderful Bate Family. This beautiful family of eight came to me to celebrate three new additions to their family with family portraits. They are the sweetest bunch! The little ones were a bit shy at first, but as the session went on, the sweet little ones came out of their shell and were the cutest little things with such personalities! We went to one of my favorite locations for pictures in Knoxville: The Botanical Gardens. They are so pretty and versatile! I can never get enough of shooting there. Knoxville professional photography session with lovely family of five in one of Knoxville's most beautiful locations. Family session in front of the Smoky Mountains, from Knoxville. Knoxville professional photographer.